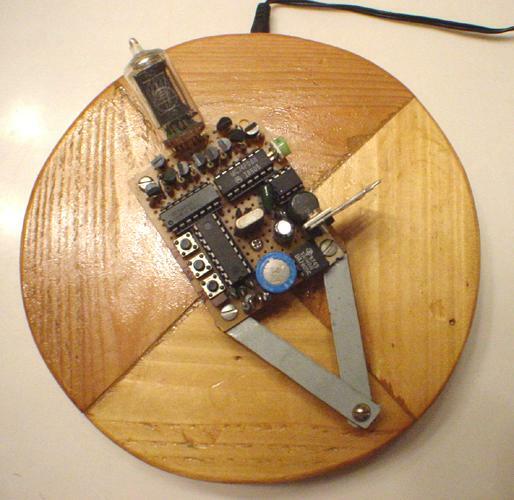 I was inspired to build this clock after I saw some links to see "Nebulus, the world's first nixie propeller clock." Unfortunately, by that time many of the links were dead and I only managed to find a video of the clock. 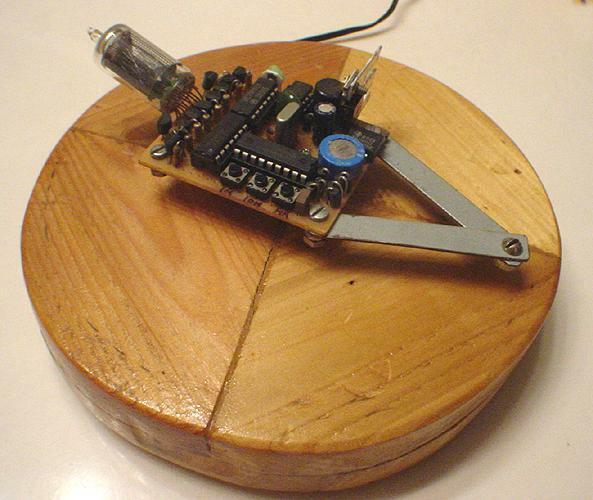 I never could find any documentation or schematics for the clock, but I assumed it probably used a microcontroller and some high voltage chips or transistors. 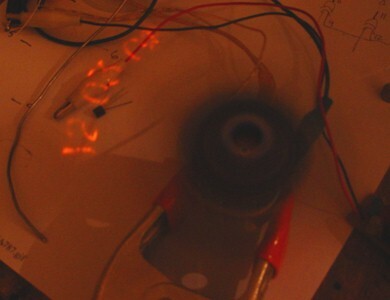 I happened to find some pictures of it buried in the Yahoo group Neonixie-L files after I built my nixie propeller clock. The values in the character table are sent to port B (where the LEDs are) in the LED propeller clock. For a nixie I did not need to bother with the illusion of a digit so I set all of the columns except one to zero. I programmed just one column to send out decimal information (1, 2, 3 ...) to port B instead of the column information. If I had a 7441, 74141 or similar BCD-to-decimal decoders, I could have easily programmed the lookup table to send out BCD to port B and let the decoder IC do the rest. Unfortunately in my case, I did not have these chips on hand so I decided to use 10 discrete high voltage MPSA42 transistors. To avoid shopping, I dug through some of my old computer boards for the logic chips needed for this project. I found a 74HC86 quad XOR chip and a 74F08 quad AND chip. I only had to use two of the four AND gates in the 74F08 so I grounded the inputs of the unused AND gates. I programmed the PIC with my modified program, nixpropclk.asm. The HEX file which is used to program the PIC: nixpropclk.hex. 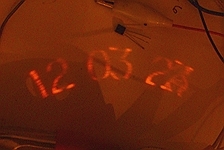 The only downfall of this nixie propeller clock is its relatively dim display that is not very visible in strong ambient light. The display brightness is slightly dimmer than nixie clocks with multiplexed displays and is best viewed in a relatively dimly lit room. 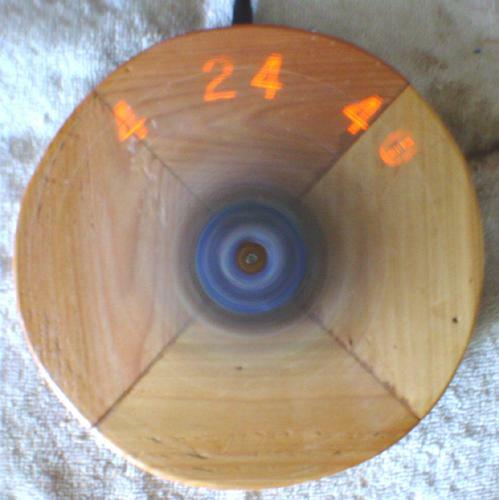 A round wooden base was built to house the motor and power supply for the clock. 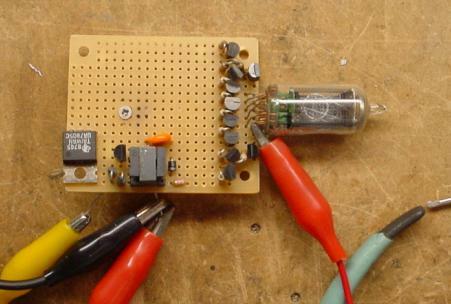 The power supply is a simple 7806 regulator and a power transistor for adjusting the motor speed. 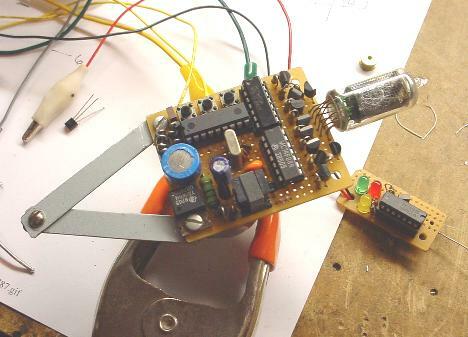 Notice that the HV generator was replaced with a simple 555 oscillator driving a FET and an inductor. The FET has an aluminium fin sticking off the right for cooling. 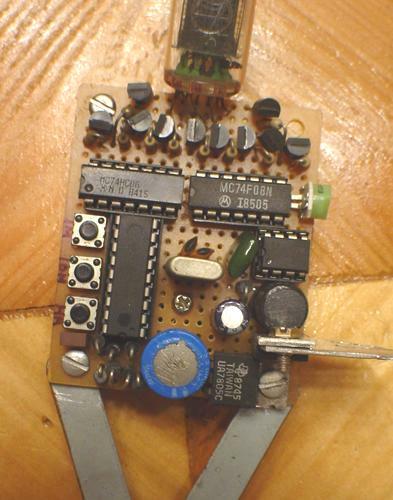 Please be cautious of the strange pinout of the 4028 and make sure the wiring is correct. Here is the assembly file with the modified character lookup table: nixpropclk2.asm and the HEX file: nixpropclk2.hex ready to program in the PIC. Please note that the software and circuit has not been tested, but theoretically they should work. If you build one and it works, please do let me know. Additionally, a 7441 or 74141 BCD-to-decimal decoder would work and no high voltage transistors would be needed because they are built in these chips.